I got my new Mundo de Unas stamping polishes in the mail and wanted to try out the blue so I built the color palette around that one polish. That falls under “inspired by a color”, right? I wanted to water-marble again and I was so happy I did! It looked like a true water marble! Now, if I could only get them in the same direction! The type of polishes I use really make a difference. I know Sammy from the Nailasaurus typically uses Barry M polishes so I gave mine a try. Wow. They work so well! True marbling is not as RA-friendly as messy marbling since it requires more precision. I only did my middle and ring nails because my fingers and wrists are flared. I used 3 coats of American Apparel Parakeet as my base. I marbled with Orly Bonder, Barry M GNP 14/Key Lime, MNP 10/Cancun, and Pop Beauty Pacific Hoot (unfortunately, Pacific Hoot got kind of eaten up when I made the rings). I sealed the designs with Seche Vite before applying a generous coat of INM Northern Lights (Silver). I stamped with MoYou London plate 04 from the Princess collection and Mundo de Unas stamping polish 4/Blue. 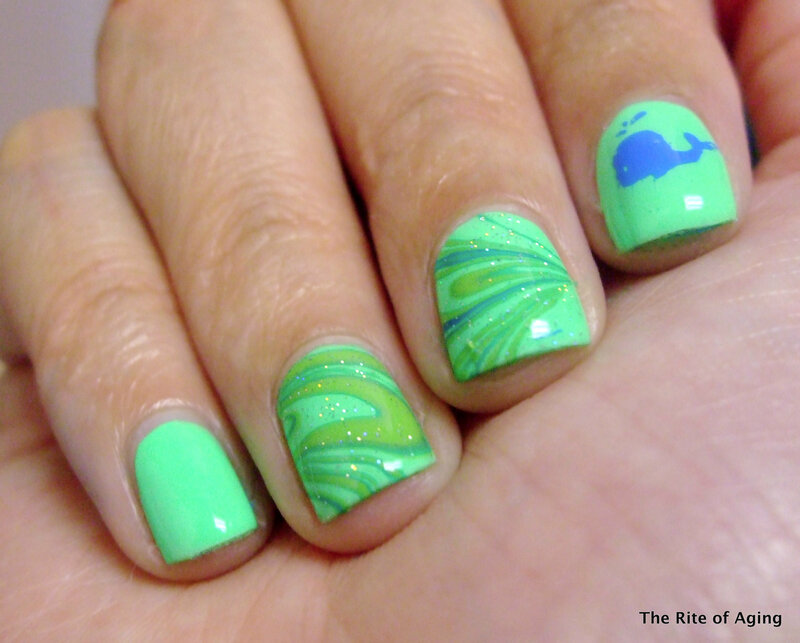 Check out the other colorful manicures below!